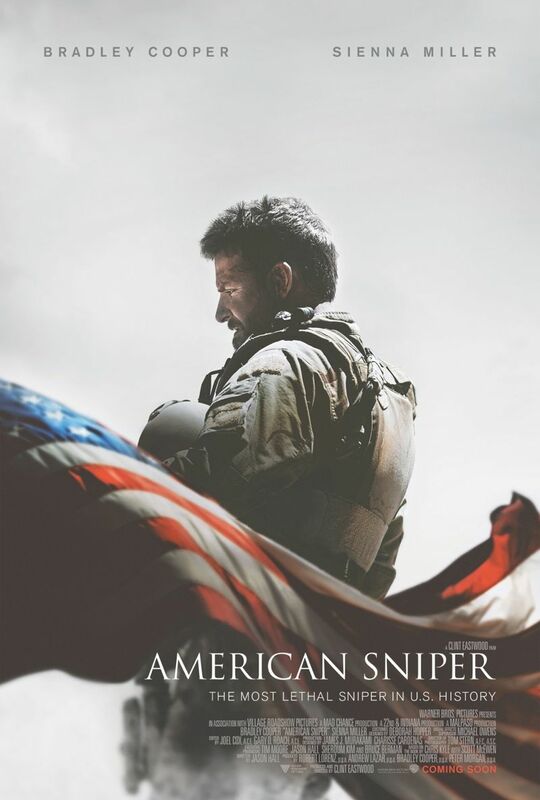 This entry was posted in Movie, Reviews, Trailer, True Story, War Movie and tagged American Sniper, Bradley Cooper, Clint Eastwood, Reviews, Sienna Miller, US Movie, War in Iraq, War Movies. Extremely well written Caroline, I will certainly be watching the movie. Thanks, Peter. I hope you’ll like it as well. I think Bradley Cooper did a really great job. I haven’t seen it yet so I will wait to watch it before I read your review and comment on it. OK. I’m very interested to hear what you think. As far as I know there were some Clint Eastwood movies you liked more than I did (Gran Torino), so I’m curious to seee if we disagree on this one. I saw it and reviewed it. You make some good points that I had not considered or did not have time for in my review. I did not like the movie as much as you because as you know, I care more about accuracy and realism. The movie has some enhancements that make it more entertaining, but tamper with history. Since it is a biopic, I don’t like it when it adds elements to make the subject more heroic. I am not as uncomfortable with the number of people he killed as you are. I was more uncomfortable with the way the movie (and most war movies) make it seem that he chose correctly when he chose his sniping over his family. He was good, but someone else (who did not have two kids) could have done his job. I have an opinion that war is not a parent’s job. I do not feel you should choose your country over your family. I also had a problem with how easily he seemed to overcome his PTSD. He is helping other veterans and yet he is cured by one trip to the hospital. You make some excellent comments about the difference between killing in battle and sniping. I agree. It would have been better if the movie added a questionable kill. There must have been at least one out of the 250. To tell the truth I found myself wondering why he was so fragile at home when nothing shown in the movie indicated he should feel really bad about what he had done. I got the impression that the movie was designed to showcase Bradley Cooper. He is amazing, but he completely dominates the movie and does not share well. You do not get to know any of his mates. He even snipes solo. I was not impressed with Sienna Miller. She was your typical whiny military wife. When she gives him an ultimatum, you know nothing will come of it. I’m not familiar enough with his story to know how accuarte it is but I got the impression the added a suspensful plot line. I didn’t think the movie said he did well in choising career over family. And I don’t blame him. I find a woman who gets married to a solider and the keeps on moang far more questionable. I think being a sniper uses a specific mind set and way of seeing the world. If you go on so many tours and for such a long time, even if you do n’t have PTSD – it will chnage the way you perceive the world. I think the movie showed that very well. I liked Sienna MIller. The worked together as a couple. So often they combine people who just look fake together. I’ll have to read your review. I’ll visit as soon as I get a chance. GQ goes to WAR – – -YET AGAIN. LAST year’s –WHO NEEDS IT?– People magazine hype. Not sure what to make of this comment. EASTWOOD and KYLE both stand compromised. —and STEPPED ON those who were THERE! Nice review, Caroline. I found the movie interesting and entertaining but it was not one of my favourite war movies. I loved the way the relationship between Kyle and Taya was depicted – I am always a fan of the quieter moments in war movies and stories. I haven’t seen many Bradley Cooper movies, but I have seen the TV series ‘Alias’ and loved his performance in it (he comes as a newspaper correspondent and his best friend seems to have mysteries in her life and Cooper’s character tries to investigate that and help her – she, of course, doesn’t need that help as she is a spy who is posing as a bank employee). I love Clint Eastwood for the way he has reinvented his career in the past twenty years as a director. I have loved most of his movies as director (I am tempted to say I love all of his movies), but this one was probably not his finest effort, in my opinion. Maybe my thoughts might change if I watch it again. Thanks for this wonderful review. Thanks, Vishy. Yes, I seem to have liked it better than you. I thought it was well done and let a lot open to perosnal interpretation. I’ve seen a few Bradlye Cooper movies but wasn’t impressed. Couldn’t even tell you the names. I’ll have to have a look at Alias. It sounds like a series I might like. I’m not always keen of Clint Eastwood’s movies but they are always thought-provoking and I like it as well that he reinvented his career as you call it.